Capacity audiences are expected to attend a diverse range of literary events for the Wild Atlantic Words Festival in Castlebar, which runs from Monday October 8 to Sunday October 14. On Monday evening at Bridge Street local authors Michael and Jim O'Connor will relaunch 'When Crowbar and Bayonet Ruled', their gripping account of the Land War and how it impacted on the Belcarra land holdings of the infamous Harriet Gardiner. Tuesday will see the launch of Anthony Broderick's book for children, 'The Adventures of Jack and Adam', followed by Diarmaid de Faoite's hosting of a bilingual discussion on Irish language literature at Castle Bookshop. Celebrated food writer, Margaret Hickey, will be at Rua in Spencer St on Wednesday for the signing of her book, 'Ireland's Green Larder' at 7.30, followed by what promises to be a musical highlight at the County Library. Here, the award winning author, Pat McCabe, will host a musical show presentation of his new book, 'Heartlands'. On Thursday, the festival hosts two events to mark Children's Book Festival at the County Library. Dave Rudden, who has been hailed as "the Irish J.K.Rowling", gives a morning event for secondary school students, with exclusive tips on Junior Cert English, followed by an event for children aged ten and upwards. The events take place at the County Library, and advance booking is advised to hear the words of the author of "Knights of the Borrowed Dark" trilogy. Other events include Soprano Liz Pearse, accompanied by musicians Lindsay Buffington and Chelsea Czuchra, at the Linenhall, presenting a new song cycle by poet Martin Dyar and composer Ryan Molloy. The poetic theme is continued with "A Poem and a Pint", a favourite event of the festival, at Bridge Street bar. For this fun event, host Martin Carney invites all to come along and recite a favourite poem. Martin Carney is on duty again on Friday morning at the Linenhall to host the results of "If I Ruled the World", a Transition Year short story event at 11 am, and later that evening (7.30pm ) Eileen Dunne of RTE will launch Mary Kennedy's heart-warming book of memoirs, words and pictures, "Home Thoughts from the Heart". Saturday's busy schedule begins with poet Alice Kinsella hosting the workshop, "A Poem in a Morning", at the Linenhall (10am - 1.30 pm, pre booking essential ). Senator Marie Louise O'Donnell introduces Northern lights at 4pm, with writers Eoin McNamee, Louisa Kennedy and Michael Nolan talking about their craft. Then at 5.30, the Festival honours local author, Anne Chambers, for her contribution to the world of books when Enda Kenny, TD, will present her with the Wild Atlantic Words Hall of Fame. 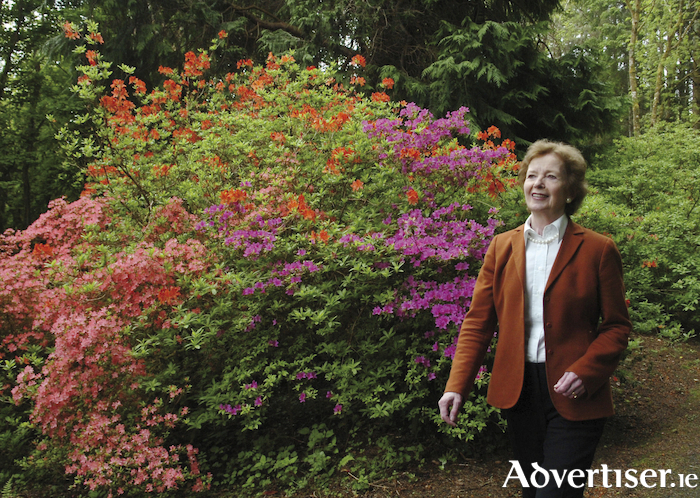 Mary Robinson makes a welcome return to Mayo at 8pm when, at the Courthouse, she will introduce and talk about her eagerly awaited new book on "Climate Justice". The former President's urgent challenge to face up to the silent menace of climate change and the existential threat it poses to humanity is set to be one of the landmark books of 2018. The festival winds down on Sunday morning at Bridge Street when John Healy hosts a panel of hometown writers for "Sunday Morning Coming Down". In a relaxed informal setting, Anne Chambers, Patrick Durcan, Ivor Hamrock and John Hoban will give short presentations, followed by audience input and contributions from the floor. Page generated in 0.1641 seconds.